Hey, this isn’t the way these things are supposed to go. What’s supposed to happen is a FAANG company (Facebook, Amazon, Apple, Netflix, Google) announces it’s entering a certain industry, and established stocks in said industry crumble in fear: Facebook (FB) says it’s getting into online dating, Match Group (MTCH) tanks 22% (May 1); Amazon (AMZN) gets into the prescription delivery business, Walgreens (WBA) breaks 11% to the downside (June 28). What’s not supposed to happen is that a FAANG stock sells off when a 150-year-old company announces it’s moving in on the FAANG’s turf. But that may have played out, at least in part, on Wednesday when AT&T (T) announced it was planning to launch a streaming entertainment platform in 2019.1 That would make it a direct competitor to Netflix (NFLX), the disrupter that struck fear in the hearts (and stock prices) of so many TV networks, cable providers, and movie studios in recent years, and which has a stock price about 10 times that of AT&T. That multiplier shrank a bit after NFLX sold off more than 8% on Wednesday, though. 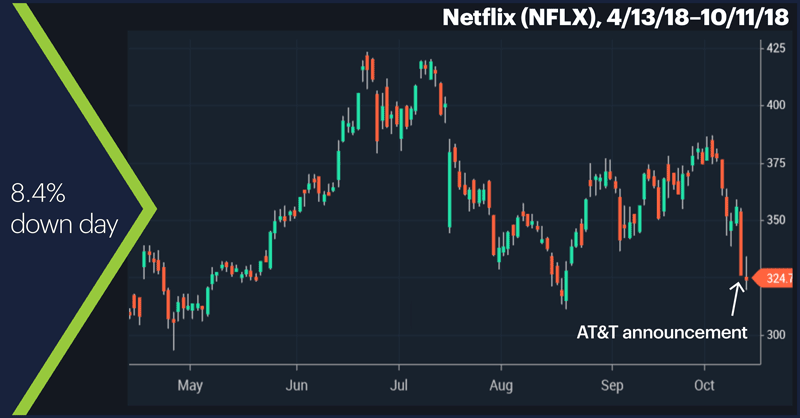 Yes, it was a brutal day for tech as a whole, but NFLX dropped much more than any other FAANG stock, and nearly twice as much as the Nasdaq 100 (NDX), suggesting its kick in the pants may have gotten some extra boot from the AT&T announcement (T fell a relatively modest 1.9% on Wednesday). NFLX, which probably seemed invincible to some traders until turning lower after its July earnings release, is now down more than 20% from its early-July high close of $418.97. To market watchers who felt the stock had been living beyond its means (it doubled in the first half of the year), the correction may seem entirely appropriate. Others may be thinking NFLX has been attractively discounted. 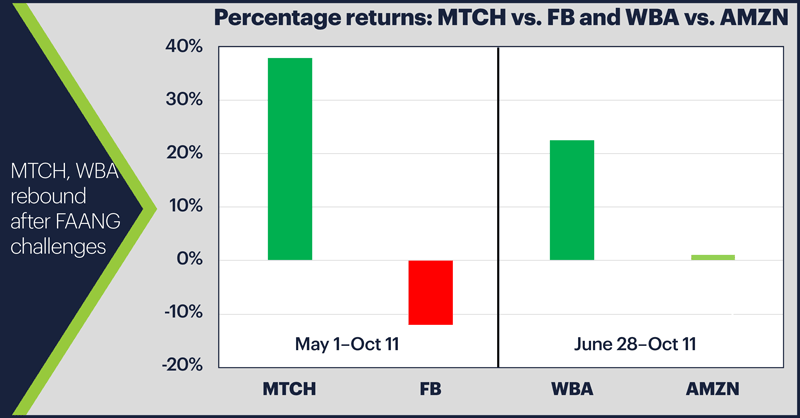 Just as WBA and MTCH didn’t keep tanking—in fact, the chart shows both have outperformed their FAANG competitors since their sell-offs—some traders may question just how much NFLX should be discounted because of AT&T’s announced streaming service (which is slated for the fourth quarter of 2019, by the way). There’s a big difference between announcing you’re going to enter the ring and knocking off the reigning champ. Note: Netflix is scheduled to release earnings after the close on Tuesday, October 16. Market Mover Update: Treasury yields eased again yesterday, with the 10-year T-note rate dropping to around 3.13%. The Cboe Volatility Index (VIX) hit 28.84 yesterday, its highest level since February 12, and nearly 150% higher than it was on October 3. December WTI crude oil futures (CLZ8) followed Wednesday’s 2.7% decline with a 3%-plus drop yesterday, falling below $71/barrel. Today’s numbers (all times ET): Import and Export Prices (8:30 a.m.), Consumer Sentiment (10 a.m.). 1 CNBC.com. AT&T will launch a Netflix rival next year. 10/10/18. Utilities running out of energy?